I've had my Apple iPad for a couple of weeks now, including taking it on a couple of trips, and people want to know what I think of it. Friday's Buzz Out Loud featured a comment from a listener that seemed to sum it up fairly well. The iPad is really all about content consumption. 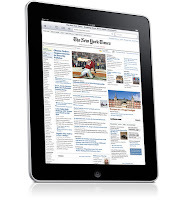 If you need to spend time in content creation, iPad is not going to be the magical answer for you. These limitations are largely built into the operating system (iPhone 4.0 vs OS X). I think the best way to look at it is as an addition to your desktop or laptop computer instead of as a replacement. Are you looking for a device you can use on the couch to check email or look for quick information on the web? If so, this might be just what you're looking for. And it's satisfactory as a travel email/web device. I love the long battery life and lack of a brick charger. I also bought the keyboard attachment so I found I could answer emails comfortably from my hotel room. I use my cell phone for quick email checks but I much prefer to answer them from a larger device. The lack of multi-tasking and Flash are continual annoyances to me. I did a recent webinar on mobile devices. I'd thought it would've been good to be able to do the webinar via iPad. But while GoToMeeting does have an iPad app, you can't run both it and Keynote (Apple's presentation app) at the same time. So, once again, you can consume content, i.e., view a GoToMeeting presentation easily but you can't create/conduct one yourself. Very frustrating from a professional point of view. But then when I'm traveling, how often do I really have to create content in a major way? Mostly I'm just trying to stay on top of things/consuming information. And I'd be happier if it ran flash so I could watch Hulu or Comedy Central but that's not a deal breaker. I've managed to find workarounds. As summer rolls in, hopefully, I think I'll like using it around the house. I have a hundred year old two story house without air conditioning. The upstairs where my office is gets really quite toasty on summer afternoons. I could always take my laptop out on the porch but the iPad is even more portable, and with its long battery life, it's a much more attractive portable option than my netbook where I have to look for an outlet after only an hour of wifi use. The final point that I think you need to be aware of when considering whether or not to get an iPad or another similar tablet device is that it's all about the apps. The iPad does have a certain appeal as an internet access device. But I don't know that most people need it for that limited function. After all, many of us have laptops and/or desktops and/or cell phones that access the internet as well. Desktops and laptops have bigger screens and keyboards and cell phones are more portable. 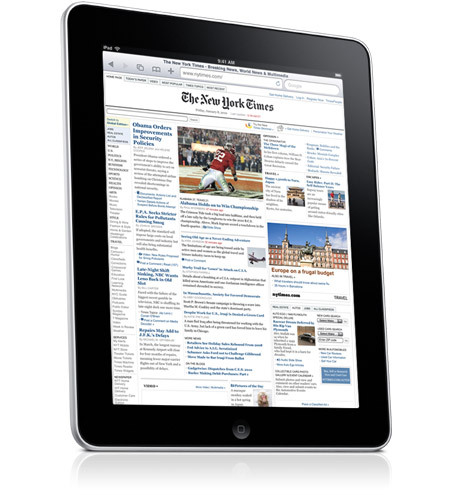 What really sets the iPad apart are its overwhelming number and variety of apps. Sure I can get baseball updates from mlb.com or a lot of other websites but their iPad app really brings it all together. This is something that libraries need to keep in mind if they're considering buying iPads for checkouts. What apps are you going to put on them? Speaking of apps, Amazon, Barnes & Noble and Apple iBooks all have ereader apps for iPad. This has led some to call iPad the ultimate ereader. While I like the fact that I can read books I've bought for other devices on iPad, I don't like it as an ereader. It's about twice as heavy as a Kindle, a lot more bulky and I don't like the backlit display. I still find the e-ink on Kindles, Nooks and Sony Readers a lot easier on my eyes. Still with 2 million sold, this could bring a lot of people around to ebooks who hadn't used them before. I brought my iPad to a mobile computing workshop we held at MSL last week. So some of my colleagues got to try them out for the first time. I thought I'd include their first impressions here. Lauren McMullen - It's not a mobile device in the same sense that a pocket-sized device is mobile. I've never used Macs before so the apps thing is new to me - apps replace programs on these devices, don't they? Apps are a nice way of customizing your device. It's a nice computer for travel but my eyes would probably go bad if I tried to do much work on it because it's small for showing web pages (although many younger people don't seem to have trouble with the size). As a computer user, I'm always plugging things into my computer, like external microphones, printers, monitors, keyboards, speakers, drives, etc. Maybe all these functions have wireless equivalents but I'm not aware of them - and I didn't see too many places to plug into the ipad. I think the iPad would be a great 2nd computer to have for taking with you on trips, but you really couldn't depend on it to be your computer for all purposes. Jennie Stapp - I think the ipad is a wonderful compromise between the portability of a mobile device and the usability of a laptop. Since I don't use a mobile phone, the internet connectivity is all I need.